Gordon Brown having bottled out of an October 2007 election ahead of an economic slump during 2008 and 2009, is now attempting to prepare the ground works for an 2009-2010 election by giving the Bank of England the green light to print as much money as is necessary to enable the UK banks to restart lending to the consumer so as to prevent a multi-year housing bear market with accompanying recession that will ensure his election defeat. The British prime minister earlier this week called in the CEO's of the major UK banks to give them a pep talk coupled with a slap on the wrist for failing to pass on recent interest rate cuts to debt ridden consumers. The Bank of England has already thrown some £100 billion at the banking sector, which includes the nationalisation of Northern Rock bank and given today's news looks set to provide another £100 billion of tax payers money on far more favorable terms in effect exchanging government bonds for bad mortgage debt, therefore acting as the counter party in an inter-UK-interbank market. The consequences of a two pronged approach of large government spending deficits that have broken Gordon Browns golden rule several times over, and cheap money to the banks in exchange for bad debt mortgage backed securities, will result in higher inflation during 2009. This will first make itself evident in the money supply data, to be followed approximately 6 months later in the inflation data. The original forecast trend for UK Money Supply growth as of mid 2007 was for a slowdown towards 10% by late 2008. 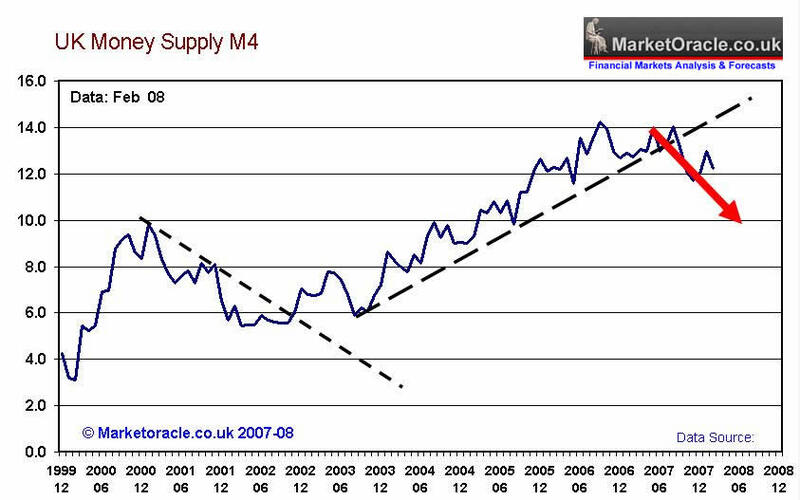 However today's news is expected to take UK money supply back towards the recent extremes of 14%+as 2008 progresses. Which would confirm higher inflation expectations during 2009. Moral Hazard has disappeared into the mists of time, as the UK Tax Payer is now bailing out the whole UK banking sector. It is akin to home owners in negative equity allowed to swap their equity loss for a UK government bond. Banking stocks soared on the news, which is not surprising given the fact that the UK Tax payer is now providing the banks with billions in as good as cash securities in exchange for illiquid junk securities. Perhaps Gordon Browns next election winning 'bright idea' will be to make up the difference for all home owners that go into negative equity during 2008 ? 17 Apr 08, 02:41 Bright idea? The government buys and forgives every UK mortgage. I'm still not convinced it wont happen, lets face it,l by the time the election comes round in 2010 he's going to be in serious trouble. Browns already going to go down as the worst chancellor and worst prime minister of this generation, I could imagine him commiting economic suicide to make sure he isnt the worst chancellor/pm to never actualy be elected. We think economic meltdown and a Great Depression would be good for the U.S. and good for the whole world in general. civil unrest, and of course anarchy. Lets just escalate these problems that already plague the world, and take the leaders, politicians, lobbyists, big oil, and big business with us, and get it over with so to speak and start anew. Or maybe an asteroid will the size of Manhattan will just hit planet earth. Now that would be painful.